Born: 28 March 1867, Den Helder, The Netherlands. Died: 18 May 1933, Amsterdam, The Netherlands. Willem C. van der Sterr, surveyor, was the son of Teunis C. van der Sterr and his wife Anna M. Burgers. After completing his schooling in Amsterdam he came to the South African Republic (Transvaal) in 1889 as private secretary to the State Secretary, Dr W.J. Leyds. He was proficient in Dutch, German, French and English, but his main interest was in mathematics. Soon after his arrival he gave up his clerical post to become an assistant to the surveyor E.H.V. Melvill*, who was engaged on the triangulation of the central Witwatersrand. When this work was completed in 1892 van der Sterr was admitted to practice as a land surveyor in the Transvaal and went into partnership with E.W. Ferguson. He became a naturalized citizen of the Republic in 1893. Early in 1899, in the unsettled period before the start of the Anglo-Boer War (1899-1902), Van der Sterr went to Dutch Guyana (now Surinam) to take part in an (unsuccessful) expedition in search of gold. From there he went to the Netherlands to study mathematics and geodesy in Amsterdam. In 1903 he returned to Johannesburg, was admitted as a land surveyor in the Transvaal Colony on 17 July that year, and rejoined Ferguson as a partner. They participated in the resurvey of Johannesburg, during which van der Sterr devised several accessories, such as a rigid plumb bob and an ingenious device for accurate chaining between reference marks. He published an account of the survey, "The triangulation of the Johannesburg goldfields", in the Addresses and papers... issued after the joint meeting of the British and South African Associations for the Advancement of Science (1905, Vol. 1), and later also in the Journal of the Institute of Land Surveyors of the Transvaal (1907, 1912). Other papers by him published in the same journal dealt with "The determination of coordinates by the graphical method" (1905-1906, in three parts), "Some notes on stereoscopic photographic surveying" (1907), and "Our survey system and its economic value" (1912). He served on the Institute's council during its first year (1904/5), and again during 1909/10. In 1904 he became a member of the South African Association for the Advancement of Science and was still a member by 1918. He presented a paper (unpublished) at the association's annual congress in 1915, on "New topographical methods and instruments". In August 1919 Van der Sterr succeeded J.J. Bosman* as director of secondary triangulation of the Cape Province. He started out in his new position by writing two official reports. One of these dealt with the reorganisation of the survey department of the mandated territory of South West Africa (now Namibia) and a proposal to impose the South African survey system on that territory. The latter he strongly opposed, pointing out that the survey methods used in the former German colony were far superior to those in use in South Africa at the time. As a result the German survey system was retained. In his second report he urged the creation of a national organisation to continue the primary and secondary triangulation of South Africa. 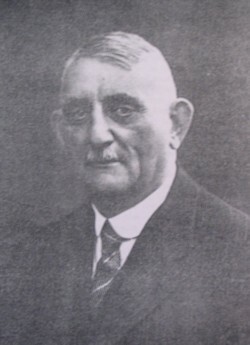 In line with his recommendation the Directorate of Trigonometrical Survey, with responsibility for the whole Union of South Africa, was established in October 1920, with Van der Sterr as its first director. He aimed to put the South African survey system on a scientific footing. On the practical side, his goal was to cover the areas between the geodetic chains that had been measured all over South Africa up to 1907 with a primary triangulation (sides of 30-40 km), then to extend the secondary triangulation (sides 10-15 km) that had already been started in places, and eventually to interpolate a tertiary triangulation (sides 3-5 km) where the development of the country warranted it. During the 14 years of his directorship primary and secondary triangulation was extended over about half of South Africa, and was eventually completed in 1962. To ensure the permanence of this work he introduced the standard 1.2 m cylindrical concrete beacon with a removable iron vane signal to mark both new and existing survey points. After a careful investigation he made the Wild type geodetic theodolite the standard instrument for the observing work. Van der Sterr was faced with the problem of harmonising the primary triangulation with the geodetic network, and the secondary triangulation with the primary triangulation. He rejected the use of geographic coordinates (as used by Colonel W.G. Morris*, Bosman, and A. Hammar*), and the local Cassini-Soldner systems, each with their own origin, used by Bosman and Hammar, in favour of plane coordinates based on the Gauss conformal projection. The width of each system of coordinates was limited to two degrees in longitude to reduce distortion. The origin of each system was the point where the odd-numbered meridian crosses the equator. This system would provide an efficient control for cadastral surveys, so as to ensure finality in the definition of property boundaries. The geographical coordinates of the geodetic points were transformed to these plane coordinates using tables prepared by Oscar A.E. Schreiber, a professional assistant in his office. Finally, the primary and secondary triangulation networks were adjusted using least squares and other advanced computational techniques. The essential results obtained in the primary and secondary surveys and associated levelling were published in the triennial reports of the International Union of Geodesy and Geophysics. He also reported on "The progress, results and methods of the trigonometrical survey of South Africa" in the South African Survey Journal (1930). Through his innovations van der Sterr managed to weld the trigonometrical and cadastral surveys into a scientific national survey system in South Africa. At the time his knowledge and expertise were far ahead of his local contemporaries. Van der Sterr was a member of the Survey Commission, established in 1921, whose work led to the Survey Act (No. 9 of 1927) and survey regulations. The methods of calculation annexed to these documents were prepared by him and served to introduce simple and uniform methods of observation and calculation among local surveyors. His efforts contributed much to the introduction of the first BSc degree in land surveying at the University of Cape Town in 1929, and he and his staff assisted in the practical training of students. In 1926 this university awarded him an honorary Doctor of Science (DSc) degree. Towards the end of 1932 his health began to fail and drastic treatment was required for a painful malady of his throat. He went to the Netherlands for medical treatment in January 1933, but died there a few months later. He was succeeded in his post by William Whittingdale. Van der Sterr was married to Anna M.A. Meijer, but they had no children. His widow left a large bequest to Stellenbosch University. Later the headquarters of the Directorate of Surveys and Mapping in Mowbray, Cape Town, was named after him. Addresses and papers delivered at the joint meeting of the British and South African Associations for the Advancement of Science held in South Africa, 1905, Vol. 1. Johannesburg: SAAAS. De Bruyn, G.F.C. Wiskunde: dosente en studente. Universiteit van Stellenbosch en voorgangers. Stellenbosch: G.F.C. de Bruyn, 1991. Journal of the Institute of Land Surveyors of the Transvaal, 1905-1909, Vol. 1(1) - 2(1); 1912, Vol. 3(4). National Automated Archival Information Retrieval System (NAAIRS). . Documents relating to Van der Sterr, Willem Cornelis / Van der Sterr, W.C. The Institute of Land Surveyors of the Transvaal. South African Survey Journal, 1979, Vol. 17(1), pp. 31-43. Whittingdale, W. Willem Cornelis van der Sterr. South African Survey Journal, 1934, Vol. 4(4), pp. 213-215; Vol. 4(7), pp. 272-277.